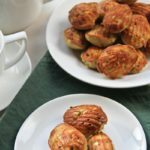 Delicious and savory madeleines made with zucchini and gruyere cheese. Recipe via The Lovely Pantry. In a medium bowl, add flour and baking soda. Combine with a whisk or a fork.